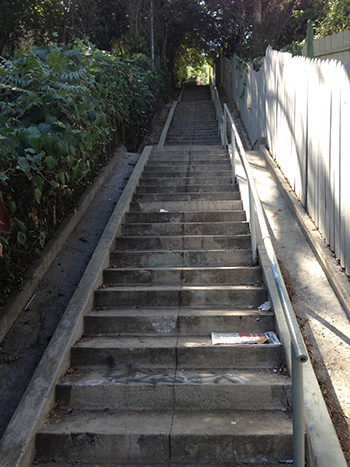 Summary: Micheltorena is a great workout and you'll feel like you're in a vertical bowling alley, thanks to the big gutters on either side of the stairs. Seriously, by the time I got to the top, I totally was wishing that I had a big pink bowling ball that I could throw down the gutter and wipe out some of the too-cool-for-school hipsters on Sunset (HA!). Another thing I like about this stairwalk is that it's divided in two parts, so there's a built-in rest/place to have a heart attack half way up the stairs.